The Tax Cuts and Jobs Act is the most sweeping tax reform measure in more than 30 years. You need to know how this act impacts your clients now and in future, and we’re here to help. Checkpoint Learning offers webinars, online courses, and live seminars in select states. What do you need to learn today? The Tax Cuts and Jobs Act represents the largest change in tax law since the big Tax Reform Act of 1986. This seminar will cover all the important details that tax professionals need in order to advise clients how they will be affected by this massive tax act. The legislation is quite complicated, but it will all be explained in plain English with many examples to make it understandable. The manual contains over 50 chapters covering all the changes that affect individuals as well as businesses. For individuals, the seminar covers new tax rates and brackets, new standard deductions, new credits, big changes on Schedule A and much more. For business, the seminar covers the new 20% Qualified Business Income Deduction, new limitations on business losses and interest expense, restrictions on deducting certain expenses as well as the big changes in depreciation. For all businesses, it has become necessary to revisit the choice of entity. The course shows how this should be tackled with examples that offer guidance to tax professionals. Finally, the course also touches on changes in the areas of estate taxes and taxation of foreign income. As a bonus, the seminar will cover more recent tax legislation such as the Bipartisan Budget Act of 2018 and the Consolidated Appropriations Act of 2018. Learn more about format options, pricing, and seminar location/date information. Webinars New Interest Expense Limitations: To Deduct or Not to Deduct? Enacted on December 22, 2017, legislation commonly referred to as the Tax Cuts and Jobs Act (TCJA) was hailed as the largest major tax reform in over three decades. The TCJA completely revised the rules in which businesses (corporations and partnerships) must follow in deducting interest expense by establishing a new interest expense regime filled with taxable income limitations, new interest expense and income definitions, unique carryover provisions, complex partnership applicability and consolidated group implications. This webinar will cover key topics for practitioners and taxpayers, alike, such as the computation of adjusted taxable income, Notice 2018-28, and various other provisions. Enacted on December 22, 2017, legislation commonly referred to as the Tax Cuts and Jobs Act (TCJA) was hailed as the largest major tax reform in over three decades. The TCJA contains a series of small business accounting method reforms that impact individual and business taxpayers. This webinar will cover the basics of accounting method changes, including Sec. 481(a) positive and negative adjustments, the structure of Form 3115, and other accounting method change logistics. The webinar will also address the implementation of the small business accounting method reforms enacted by the TCJA, including Rev. Proc. 2018-40. The Tax Cuts and Jobs Act (TCJA) introduced the new Code Sec. 199A qualified business income deduction but left many questions unanswered. The IRS has issued final regulations on the Code Sec. 199A qualified business income (QBI) deduction, along with accompanying Rev. Proc. 2019-11 and Notice 2019-07 (addressing wages and real estate enterprises, respectively). The final regulations will be examined in-depth, including the operational rules of Reg(s). 1.199A-1 and -2, Reg. 1.199A-3’s discussion of QBI, the aggregation rules of Reg. 1.199A-4, the specified service trade or business rules of Reg. 1.199A-5, and more. Detailed examples and computations will be presented throughout the discussion. This webinar will provide a summary of the TCJA changes, and an objective analysis of the impact on clients and the profession. By the end of this webinar, tax professionals will be in a position to advise clients on how the act could possibly affect them. We will cover changes in tax rates, standard and itemized deductions, and personal exemptions; adjustments to income which will no longer be allowed; the 20% deduction available for qualified business income; corporation tax rates decrease; estate tax changes; new and modified personal and business credits; the increase of code section 179 expensing; and the lowering of taxes generally on business income. 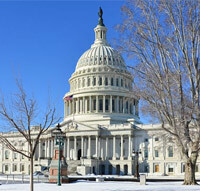 The Tax Cuts and Jobs Act has taken a hatchet to Schedule A as we have known it for years. Several items have been limited or repealed. That combined with the significant increase in the standard deduction will result in fewer taxpayers itemizing deductions. But that makes it even more important to plan on maximizing deductions for those clients who will still itemize. In this two-hour webinar we will talk about the new limitations for mortgage interest, taxes, charitable contributions, employee business expenses etc. But we will also talk about ways to benefit by timing deductions on Schedule A or by rearranging transactions, so the benefit is obtained elsewhere on the tax return. The 2017 Tax Act has dramatically changed the landscape of US federal income taxation, both for individuals and business entities. In the case of S Corporations, the changes (and improvements!) include a modest reduction in individual tax rates and a meaningful broadening of individual tax brackets (so that the tax rates are both lower and take effect at higher levels of taxable income) and, most excitingly of all, the introduction of a new Qualified Business Income ("QBI") Deduction. This will allow individual S Corporation shareholders to exclude as much as 20% of S Corporation income from their individual returns, lowering their effective tax rate on this income by at least 20% (and in some cases closer to 25%). The QBI Deduction is the biggest and most widely discussed change for S Corporations, but there are lots of other important changes to discuss as well. This webinar will explore the very interesting and challenging questions about how best to evaluate a "Choice of Entity" decision, whether to retain S Corporation status, elect S Corporation status and/or convert to C Corporation status, the impact of business interest limitations, and a host of other important issues. Best of all, this webinar will provide an in-depth and clear explanation of how the very complicated QBI rules apply to S Corporations, and how to develop strategies that maximize the QBI Deduction and significantly reduce income taxes for S Corporation shareholders. The TCJA contains a host of tax provisions that impact individuals. This webinar is part one of a two-part series that will examine the most important provisions for individuals, including income tax rates, standard deductions and personal exemptions, the enhanced child tax credit, changes to Section 529 and ABLE accounts, temporary and permanent changes to itemized deductions, and more. Part two of a two-part series that will examine the most important provisions for individuals, including the new Code Sec. 199A qualified business income deduction, limitations on losses for non-corporate taxpayers, alternative minimum tax (AMT), alimony deductions, and more. It's true that the Tax Cuts and Jobs Act has restricted some of these deductions but it's not as bad as it first seemed. Even the IRS has given guidance pointing out the Home Equity Loans may still be deductible. But it is necessary that we understand how things have changed and the new limitations for Mortgage Interest, State and Local Taxes, and Casualty Losses. These will all be explained in detail at this 2-hour webinar. In addition, we will identify some of these items which may well be allowed elsewhere on a tax return. We will also cover the important differences between a personal casualty loss and a Presidentially declared disaster. Probably the most significant part of the TCJA is a brand-new deduction for small business. Most business owners will get to reduce taxable income by 20% of the net business income from sole proprietorships, partnerships, and S corporations. This is huge, and your clients will want to know as much as possible as soon as possible. But, as to be expected, it is not simple. There are several limitations and requirements to take advantage of this new opportunity. All of these will be explained at this two-hour webinar with lots of examples to make it perfectly understandable. For all businesses it will be necessary to reconsider choice of entity in light of the new tax law. Many tax planning opportunities will be examined to enable you to provide the greatest assistance to your clients. Because of the Tax Cuts and Jobs Act, it really is necessary to reconsider choice of entity for every one of our business clients. The new Section 199A Qualified Business Income Deduction (QBID) makes sole proprietorships, LLCs and partnerships more attractive and could make some S corporations not so attractive. At the same time a 40% drop in the tax rates for C corporations will result in more of those in the future. Even personal service businesses may well choose to be C corporations. You will be busy meeting with all your clients and running the numbers to allow them to make the best choice. At this 2-hour webinar we will make sure you are equipped with all the knowledge required to provide this service. Enacted on December 22, 2017, legislation commonly referred to as the Tax Cuts and Jobs Act (TCJA) was hailed as the largest major tax reform in over three decades. The TCJA contains a host of tax and cost recovery provisions that impact businesses. This webinar will examine the permanent changes to C corporation tax rates and corporate AMT, new disallowance rules affecting meals and entertainment expenses,100% bonus and Section 179 depreciation, and more. Enacted on December 22, 2017, legislation commonly referred to as the Tax Cuts and Jobs Act (TCJA) was hailed as the largest major tax reform in over three decades. The TCJA contains a host of cost recovery provisions that impact individual and business taxpayers. This webinar will examine the enhanced Section 179 deduction, the 100% first-year deduction for qualifying property, the shortened recovery period for new farming equipment, the shortened recovery period for certain real property, and more. The webinar will address cost recovery planning considerations in the wake of the TCJA. All the Changes Come to Roost on the Tax Forms! Reviewing the changes on the 2018 tax forms is a great way to recap the multitude of changes resulting from Tax Cuts and Jobs Act. It’s all about the tax return. The theory is important, but the practical application includes knowing where it goes on the tax return. This webinar starts with a review of the new postcard size 1040 and the six accompanying schedules. We then move on to the significant changes on Schedule A, Schedule C, K-1, and many other forms, worksheets and IRS instructions. You will see brand new forms never seen before 2018. This webinar will serve as a check list to make sure no changes have been overlooked in preparation for a wildly different tax season. We will also explain briefly each of the changes as they are identified. This course discusses 49 provisions that individuals and small business owners need to know. The TCJA includes many tax changes, most of which were expected because they were included in earlier legislative proposals. However, some were unexpected — and some expected changes did not make the final cut. The changes that affect individuals are effective for 2018-2025 unless otherwise indicated. After 2025, the pre-TCJA rules are scheduled to come back into force unless otherwise indicated. International Tax has always presented challenges due to its technical complexity. The Tax Cuts and Jobs Act of 2017 (TCJA) further added to those challenges. There are significant changes to this area as well as modifications to long standing international tax concepts. This program provides an overview of the main international tax provisions contained within the TCJA. Tax practitioners will benefit from the discussion of all these provisions, including the new corporate tax deduction for foreign source dividends, the new tax on global intangible "low-taxed" income, the new deduction for foreign derived intangible income and the new tax on base erosion payments, i.e. the BEAT. There is also a discussion of the long-standing international provisions that were modified, such as the number of foreign tax credit baskets, the changes to the definition of "U.S. shareholder" and its impact on controlled foreign corporations. And in making the transition in international tax from a "credit" based system to a "participation exemption", the transition tax affecting deferred foreign income is also discussed. Seasoned international tax practitioners as well as those practitioners with a "need-to-know" international tax, will find program useful as well as interesting. The 2017 Tax Act is a very complex piece of legislation. The law was clearly intended to cut taxes and create jobs, but it pursues these goals in a variety of remarkably complicated ways. And no new provision is more emblematic of the Act ... cutting taxes and promoting jobs in a stunningly convoluted way ... than the extremely favorable new deduction called the Qualified Business Income Deduction which is contained in Internal Revenue Code Section 199A. This course is entirely devoted to the new Qualified Business Income Deduction. This course is most appropriate for the professional with detailed knowledge in taxation of individuals who may be at a mid-level position within an organization with operational or supervisory responsibilities, or both. The Tax Cuts and Jobs Act was signed into law by President Trump on Dec. 22, 2017. This legislation is the most sweeping tax reform measure in more than 30 years. This course provides a general overview of the C corporation provisions from a broad perspective and is appropriate for the professional at any organizational level. Since this is a brief overview, please refer to the Thomson Reuters Checkpoint Complete Analysis of the Tax Cuts and Jobs Act for more details on this subject. The comprehensive tax overhaul of the Tax Cuts and Jobs Act dramatically changes the rules governing the taxation of individual taxpayers for tax years beginning before 2026. The Act provides new income tax rates and brackets, increases the standard deduction, suspends personal exemptions, increases the child tax credit, limits the state and local tax deduction, and temporarily reduces the medical expense threshold, among many other changes. The legislation also provides a new deduction for non-corporate taxpayers with qualified business income from pass-through entities. These materials rely heavily on the Thomson Reuters Checkpoint Complete Analysis of the Tax Cuts and Jobs Act. This course addresses changes in tax law pursuant to the Tax Cuts and Jobs Act (TCJA) that will impact taxpayers who file a Schedule C. The course discusses the new Section 199A Qualified Business Income deduction that is available to eligible Schedule C filers. In addition, the course will look at the phase-in rules for application of the W-2 wages and assets calculation in determining the Section 199A deduction, as well as the deduction phase-out rules for taxpayers in specified service trades or businesses. The course provides examples of various fact patterns and walks participants through the Section 199A deduction computations. Lastly, the course will address potential tax-saving strategies taxpayers could employ to reduce the income tax due under the new provisions of the TCJA. While the TCJA made many changes to the U.S. Tax Code, among the entities most dramatically impacted were partnerships and S corporations. 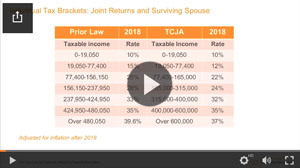 And since these are pass-through entities (meaning income, deductions, gains, losses and other items flow through to the income tax returns of the partners or shareholders that own them), these TCJA changes also impact individuals. The most significant of these changes relate to the new Section 199A deduction, the increase in bonus depreciation, the increase in Section 179 expense, and some changes related to S corporation conversions, as well as accounting method changes. This course provides an overview of the changes. It is most beneficial to professionals new to the Tax Cuts and Jobs Act who may be at the staff or entry level in organization but also for a seasoned professional with limited exposure to the impact of changes made as a result of the Tax Cuts and Jobs Act. This course provides a general review of the provisions from a broad perspective and is appropriate for the professional at any organizational level. This course lists the legislative changes applicable to 2017 tax returns and provides an analysis of the more common items with respect to individuals, S corporations, business deductions, bonus depreciation, and more. With tax reform and massive changes to corporate taxes, accountants still have to follow ASC 740, Accounting for Income Taxes, to reflect the potential impact on deferred taxes in the financial statements. The SEC has given publicly traded entities a temporary reprieve on the exact calculations, and the FASB has followed suit for private companies. Paul Munter reviews the impact of the Tax Cuts and Jobs Act on the financial statements of corporate entities including the impact of repatriation of earnings, the BEAT and GILTI taxes. On December 22, 2017, President Trump signed into law H.R. 1, the sweeping tax reform legislation commonly referred to as the Tax Cuts and Jobs Act (TCJA). Earlier drafts of the bill proposed major changes to the Internal Revenue Code related to tax-exempt entities. Many of the proposed changes were excluded from the final version of the bill, however, the TCJA contains significant changes for many tax-exempt entities effective January 1, 2018. It is important that practitioners be aware of the changes to properly advise both tax-exempt entities and donors. 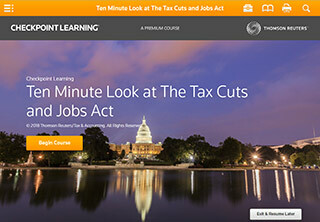 Also available: Free TCJA micro-learning course! In the Ten Minute Look at The Tax Cuts and Jobs Act, we discuss the Tax Cuts and Jobs Act, highlighting some of the retroactive elements of the new law and a few other notable items that you should be cognizant of during the 2018 filing season or in planning for 2018 going forward. These popular courses have been fully updated in relation to current tax reform. 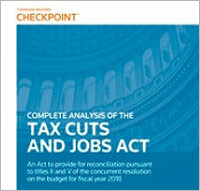 Checkpoint Special Study on individual tax changes in the Tax Cuts and Jobs Act. More CPE topics. Faster updates. Checkpoint Learning webinars, 600+ online courses, and much more with Premier Plus. Comprehensive coverage from Checkpoint on the most sweeping tax reform in 30 years. *Click for more information on the Premier and Premier Plus CPE Package subscriptions, which include unlimited access to all Checkpoint Learning online courses plus live event discounts, CPE compliance tracking, and more. Premier includes unlimited access to all 1-4 hour Checkpoint Learning webinars; or choose Premier Plus for unlimited access to ALL Checkpoint Learning webinars, including full-day!